OUR KEY ELEMENTS: ADVENTURE. PEOPLE. NATURE. You’ll find these key elements in all of the travel experiences we create. NATURE: This is the best part, we are blessed with a country with amazing nature. We’ll make sure you see the best of it and discover the hidden corners that will make you hold your breath in awe. Nature as a concept has been socially constructed as an object and a subject that provides people with meaningful experiences. Accordingly, leisure activities in nature will enhance the interaction between people and the natural environment, and will increase their attachment to it. People will become more conscious about conservation of protected areas and will be more sustainable in the way they travel. Amity Tours has been developing nature-based experiences in Chile and Argentina since 2003. Each of our trips has been planned with the idea of providing tranquility and spiritual well being to our travelers. By walking and hiking through a native forest, kayaking in pristine lakes and rivers, biking through rolling hills and skiing in active volcanoes, we provide significant and invaluable memories to our guests. Some of our most popular trips occur in the Lake & Volcano district in Chile. This area has been labeled a Biosphere Reserve by UNESCO. National Parks such as Conguillio, Villarrica, Huerquehue, Alerce Costero, and Vicente Perez Rosales had been stages for our trips providing hiking and biking trails to develop the aforementioned experiences. Our goal is that our guests learn more about our endemic species through these meaningful experiences, enhancing their connection with nature in wilderness areas. 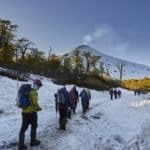 Imagine yourself hiking through an ancient forest where you can observe a 2,000 year old Araucaria trees or imagine yourself climbing to the summit of the most active volcano in Chile. What’s more, you can also bike around lakes on remote roads meeting local people and enjoying amazing landscapes. Nature is one of Amity Tour’s defining concepts when designing trips. We believe in sustainable tourism and we also believe that this type of tourism helps people to be more conscious about the environment. We invite you to experience nature with us!